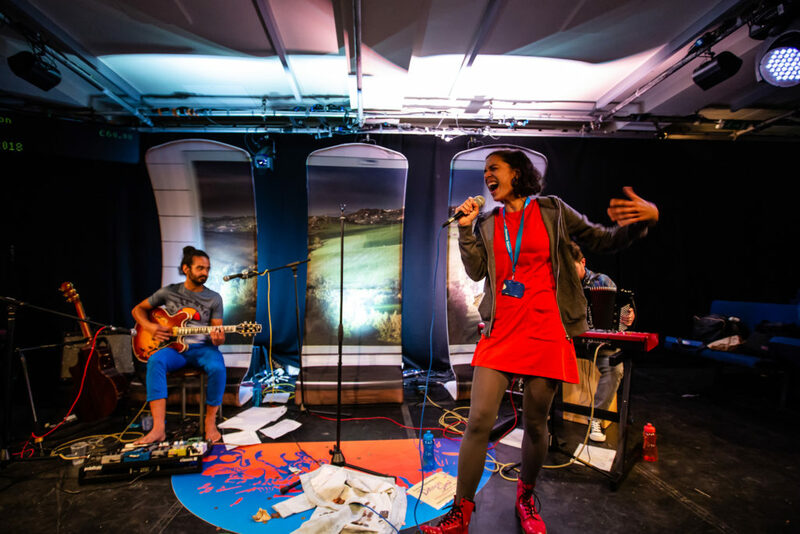 The basement space in Shoreditch Town Hall is the perfect fit for Danusia Samal’s one-woman show about the ten years she spent busking on London underground platforms. enters, kindly lulling us into the world of her show. underground platform, or when she serenades the commuting object of her affection. The ending is properly moving, building on a personal narrative through-line that demonstrates a subtle political message behind the work. However, the show is too long, exacerbated by a repetitive line enquiry that doesn’t always fit deftly into the personal narrative structure. As is common practice for solo work, Samal plays with different accents to introduce new character interactions, but some of those employed more frequently prove grating after a while. Furthermore, the build up to a musical moment, set up as a poignant climax, is not quite realised. This isn’t down to Samal’s emotionally layered performance, by rather the narrative structural flaws that can’t support it. The show is sincerely warm, peppered with genuinely uplifting moments. However, the tone of the work often straddles sentimentality. Samal’s singing carries the show; there could have been more of it, and the pleasure of listening to her makes up for any of the show’s failings. Busking It runs through 20 October.